Pastor Stephen (Steve) Springer has been an ordained minister in the Evangelical Lutheran Church of America for 20 years and has led Dove of Peace since late 2005. A graduate of the University of Chicago Divinity School (M.Div. 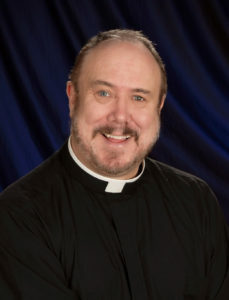 1994), Pastor Steve’s professional interests are liturgical worship, New Testament theology, ecumenical and interfaith dialog, church history, and advocacy. He enjoys leading Dove of Peace because of the generous hearts and open minds of its members, its history of liturgical worship and music, and its commitment to being a force for good in the community. Pastor Steve was born in Louisiana and raised in the South and has fond memories and ties there. “Southerners know how to tell stories and how to cook”, he says. “I can’t imagine a life without good stories and good food.” Cooking is Pastor Steve’s favorite hobby and “inspired” the food served following Dove’s annual Mardi Gras event. He dabbles in computers and electronics and from time to time works with abandoned dogs. He attended college in San Antonio, Texas, where he began to study Spanish language and the history and culture of Mexico. He has an avid and ongoing interest in Latino culture and the heritage of the Southwest, including, of course, the food. (On the contentious local issue of BK versus El Güero Canelo, he is a BK man.) He fell in love with the Sonoran desert when he first visited Arizona in his early twenties and was delighted to move here in 2005. His favorite book of the Bible is Isaiah.